Jeddah Municipality has implemented a balanced scorecards methodology in measuring the whole performance of the organization. Having implemented a multitude of metrics in the balanced score cards they needed an automated solution to gather the information of these metrics from different data sources and systems. Disparate data used to create confusion and inefficiency, and diffuses accountability. Metrics based on this data were often incomplete, conflicting, or limited to a particular department or function. Managers working with this data used to spend more time discussing the validity of the data than using it to manage performance. Metrics might show that a problem existed, but not who was responsible for solving it. In addition, managers interpreted metrics differently from what executives intended. As a result, their teams may focus on objectives that conflict with overall strategic goals. Jeddah Municipality needed a scorecarding application that can collect data from various systems and that can be delivered to every employee so they can monitor their own performance. The Municipality also needed an application that provides the necessary analytic capabilities that will enable managers to understand why performance is on or off track. By the fourth quarter of 2013, Jeddah Municipality contracted IT-Blocks to build the Balanced Scorecards solution according to the Municipality’s needs. The project started by the end of 2013 and the development continued throughout 2014 untill its successful completion. 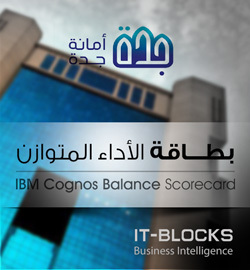 IT-Blocks Balanced Scorecard Solution built on Cognos Business Intelligence software provides scorecard capabilities that enabled Jeddah Municipality to create, manage and present their critical metrics. Users throughout the organization can understand the dynamic cause-and-effect relationships of the key processes behind those metrics. The solution drives accountability with a consistent and reliable source of metrics for individual employees, managers and executives. Most importantly, it links individual decisions and tactics to corporate goals and strategy. The solution manages the full scope of business processes, from projects at the tactical level to corporate-wide strategies. The solution links strategy to operations and provide business units, departments and individuals with a common understanding of metrics and actionable information about basic, day-to-day business performance. It is designed to provide managers with the relevant tactical information they need to translate strategy into action. It provides a full range of BI capabilities for all users, from a single product, on a single architecture. It can directly access BI reports, analysis, and alerts that help business users go beyond their metrics to analyze and understand the factors that drive performance. Embedded initiative tracking and collaboration capabilities help users manage actions or projects they undertake when a metric turns red or begins a downward trend. How have we performed against this metric in the past? Who is involved in solving this problem? Have corrective actions been taken? What are the factors driving performance? What other processes or metrics are affected? To cope with the current technology used at the customer site the solution included a heterogeneous set of technology tools. MS SQL was used as the ETL tool to transform data from the operation databases to the Oracle Data warehouse that was already implemented at the customer site. A data entry system was developed to collect data of non-automated data sources, while, IBM Cognos served as the main tool to implement the balanced scorecards. Besides, a security system was implemented to define different roles and responsibilities of various users of the system.